I need to replace a damaged headset that has developed brinelling. This is the bike's second headset that has developed this kind of damage, and I have concluded my initial adjustment of freshly packed bearings must actually be too loose as the grease settles. Therefore I plan to tighten the adjusting cup about an 1/8 turn more than I would previously and/or be ready to readjust the bearings after the first week of riding. I am not sure if the first two are the same, both being alloy, perhaps simply titled differently. I usually found chrome headsets to be about half the price of comparable alloy versions, but not in this case for what is currently showing on ebay. If there are no real advantages to an alloy headset for durability, another chrome (adjusted a bit more tightly) seems best as I also prefer the smoother finish. By the way, if a slightly loose bearing develops pitting, what is the effect of a headset adjusted on the side of being tight? Also, I am trying to replace this headset before riding the bike much after a LBS owner mentioned how a loose headset can cause deformities to the headtube over time. Not sure if this applies in this case with the headset loose only to the point of feeling a bit play while holding the front brake and rocking the bike, and only while the handlebars are pointed straight forward, the most common riding position -- is this notion of damaging a frame with a slightly loose headset unfounded? Riding with a loose threaded headset likely won't damage the frame, but it can damage the fork, as the threaded cup can erode the threads on the steer tube if the headset isn't properly adjusted. If your wear is just where a few bearings sit, that's too loose. If it were too tight, you might see damage all around the circumference, but I'm just guessing since I've never seen that in a headset. If a headset were too tight, I think the handling would be objectionable. Your plan to readjust is a good one. Better to be just a tad on the tight side to properly load the bearing. Is this a road/commuter bike? Lots of miles on it? That means your headset is too loose. Headset bearings should not have play. The LBS guy was talking about bearing adjustment. If there's play in the bearings, then the impacts that headsets deal with all the time aren't being distributed nicely across the full race, they'll be hammering the front and back of the races. That's bad for both the bearings and the thing they're sitting in. I have replaced several 1" headsets with Tange Levin NJS. They are an appropriate looking replacement for vintage bikes, and they are excellently built, but, you are going to pay for that "NJS" designation. They make a less ornate, non-NJS-certified headset for a paltry ~$25. It is available both in ISO and JIS. Assuming this is for a road bike, and the headset is properly adjusted, the damage you have was probably caused by lack of lubrication replenishment. Searching for 'false brinelling' will lead to plenty of information about this. For what it's worth, the same kind of damage happens in suspension bearings on mountain bikes. Have you had the head tube faced? Check the location of the brinelling i.e. is the it oriented or more significant in one area? Makes even a mediocre headset perform better. An eighth of a turn is absolutely enormous when adjusting headsets. If that's your idea better to take this to a mechanic. Overtightened headsets fail very quickly. I get ~8000 miles per Tange HS. Another 1-2000 after upping the balls one size. For $30 and one adjustment/year (tighten 1/8th turn), I call it good. Edit: I wrote 1/8th turn before reading the last post. 1/16th might be closer. I DO NOT get my HSs too tight. Scroll down to middle of page. Head tubes ovalize when there is loose play to level of banging. Definitely happens, not that common. Just as often a loose HS and some impacts will bow the steerer. Which can be harder to fix than the oval headtube. OTOH a very slightly, I mean slightly, loose HS is the one that will last more or less indefinitely. No such thing as preload on a HS. Any tightness, one degree of tightness, you have a head bearing about to fail. Most head bearings do fail in short order, but they can be ridden a long time brinneled without anyone noticing. Exact same HS, any brand or model, adjusted perfect lasts forever. Raleigh headsets that were less than a dollar BITD could last as long as a Campy. Really cheap HS with stamped cups give long service if cared for. Perfect doesn't that much happen and you don't have to beat yourself up if not achieved. Ten thousand on a Tange sounds short to me but I have sure done worse. If getting that consistently whatever you are doing is darn close and leave it alone. Poster who claims not to have seen dented headsets needs to ride more. Giving up on cup and cone heads and using needle bearings/cartridge bearings is reasonable. There are still millions of cup and cone bearings out there and mechanics should know how. While roller bearings have their advantages, primarily the ability to take higher loads, this is irrelevant for headset bearing durability. It's the fore-aft micro movements that destroy the bearings (OK, mud and water as well, for the lower one, especially if not using mudguards). For handling fore-aft vibration movement, these bearings are worse than angular contact ball bearings. They can help those with high speed bar shimmy problem - since they provide a bit more drag (and hence rotation damping). But for durability, I wouldn't bet on these over good quality angular contact ball bearings. My 2c on bicycle bearing types. Last edited by Bike Gremlin; 03-22-19 at 01:05 AM. OTOH a very slightly, I mean slightly, loose HS is the one that will last more or less indefinitely. No such thing as preload on a HS. Any tightness, one degree of tightness, you have a head bearing about to fail. Most head bearings do fail in short order, but they can be ridden a long time brinneled without anyone noticing. The same person I spoke with who spoke of loose headsets ovalizing headtubes over time also said a headset slightly tight being preferable to slightly loose. My impression is that if there is any bit of play in the bearing, the resultant micro-impacts will wear an indentation on the races in the front and rear of the assembly. Just to clarify, I said 1/8 in an offhanded way but what I really meant was something more like 1/16. As alluded to above, I am starting to lean toward the idea of a very slightly preloaded bearing idea. Also, to advise someone who is working to refine their understanding/technique instead to visit a professional is ridiculous, not to mention antithetical to using this forum. Assuming this is for a road bike, and the headset is properly adjusted, the damage you have was probably caused by lack of lubrication replenishment. Searching for 'false brinelling' will lead to plenty of information about this. This headset was only recently installed and usually likely pack more grease than necessary, which can make it more difficult to adjust initially, requiring readjustment more quickly as the 'grease settles.' I have installed and ridden many headsets that have not developed problems, but the speed of failure on this begs investigation. The main reason I am not actively looking into a different headset is because my steerer tube is exactly the right length for the stack height existing headset. Also, it seems there is little reason to source the alloy variety just to shave a few dozen grams off a 27 lbs steel bike. Making sure the mounting surfaces for the races are parallel is great advice. Last edited by joedab; 03-26-19 at 10:15 AM. You mean the Record threaded headsets that you can buy new for half that price? 1/16 of a turn is still 22 degrees of turn, which is a crude coarse adjustment on a headset. This means you are not even beginning to get good adjustment. You're working like a truck mechanic. Try reading the link I gave you previously. It's from Tom Kellogg, whose reputation and experience as a mechanic are pretty well known. And he's a fair writer. When it seems that someone posting here is just not getting the drift and is set on doing things that will damage their bike, and take them in directions they don't want to go, yes, I will recommend using a professional. Antithetical? Sometimes it does seem like the idea here is everyone should learn by destroying fleets of bikes. Preload simply does not work on headsets. If you think it does you have not worked on headsets and are missing the point. Work on a few thousand headsets for a few decades and then inform us of your wisdom regarding preload or other subjects. Or do it your way and get a bigger hammer. Although quality of the headset can be part of the problem, typically when I see the brinelling you are experiencing it is due to the headset being loose. When I assemble a headset after cleaning and greasing, I rotate the fork as I am snugging the headset. I tighten until I can feel it start to bind and then back off slowly intil it feals smooth. I then go for a test ride which should ensure that the bearings are well seated and check to make sure it has not loosened. You should check the headset for play regularly as it literally takes a couple seconds. So what problem was the brinelling causing you? Were you actually able to feel it while riding the bike? I haven't looked at my schwinn, but my raleigh and previous bikes had marks on the headset races that looked like brineling, but were probably just slight surface corrosion on the part of the race the bearing wasn't touching. I think I only found binelling for real on one headset ever, and it wasn't anything that was noticeable while riding. There is no brinelling in these bearings. It is a matter of fretting because of lack of motion relubing the balls. 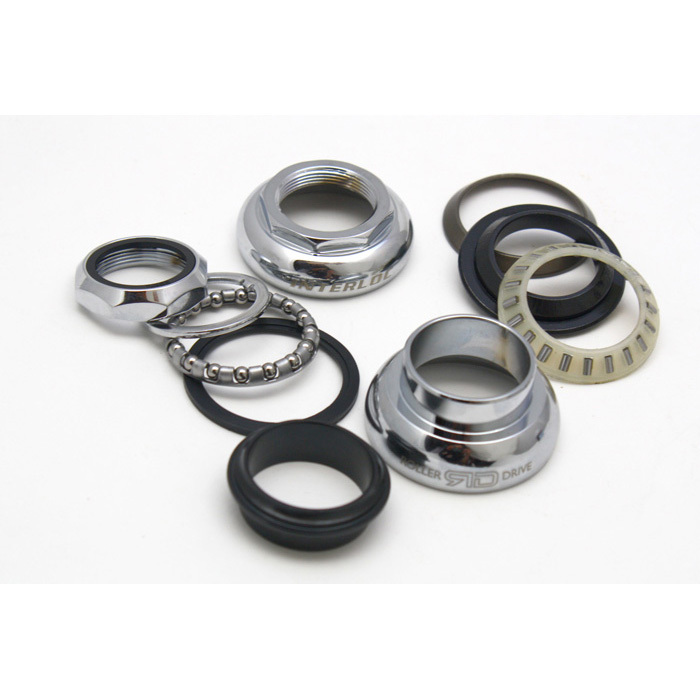 They are no better than any other old style headset bearings. But they are new, so you know that everything is starting out in good shape. Plus, you know that the tolerances are good, which is important for a press-fit piece. The headset brinelling is most noticeable when riding without hands where the free rotation of the front wheel of minute amounts is crucial. The way I test for brinelling is by holding the top tube of a bike on my shoulder, leaning the headtube down so the headset is able to sway like a pendulum. Knock the handlebars a bit and watch the motion .. if the front wheel tends to favor slowing and ultimately stopping/snapping to the centerline, the bearing has brinelling in this most common of positions. When riding no-handed, the wheel is resistant to tracking along a line other than center and therefore for a slight adjustment or curve, one need lean far enough to snap the bearings out of this indented position, which leads to a series of over-adjustments just to remain a desired course. I have since tightened my headset just a skosh, enough to eliminate the play there was in the position with the brinelling, and although it probably favors this position to a greater degree, I feel good about this adjustment until I am able to replace the headset, since the lack of play should eliminate further pitting and any stress transferred to the headtube. The takeaway from this bearing casualty might be to readjust a new headset soon after installation especially if one has a tendency to err on the side of too much grease. My conception of a properly adjusted bearing is like balancing a razor's edge, being impossible to maintain with a number of factors that can move the position of this edge, and if the slightest amount of play can be the seed of bearing brinelling it would seem leaning toward a bit tight (preloaded) is better than anything loose or even 'perfect' since this can change over time. When testing for play using a method of rocking the bike back and forth with the front brake locked, grease doesn't "mask up" any play, so there shouldn't be any need for re-adjustment, if it's done properly. The swing method described is great for testing if there's too much preload.